Now, the thirty seventh king of Tibet, Trisong Detsen, had invited the great pandita Shantarakshita, also known as Khenpo Bodhisattva, to establish Buddhism in his country. 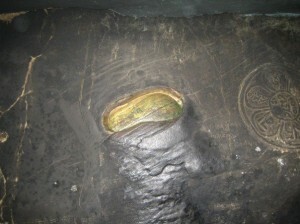 The author of the famous Ornament of the Middle Way (Skt. Madhyamakalamkara) and Compendium on Reality (Skt. 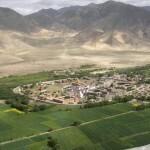 Tattvasamgraha), Shantarakshita began teaching in Tibet, and laid the foundations for Samyé monastery. This provoked the local spirits, who embarked on a campaign of disasters—disease, floods, storms, hail, famine and drought—and whatever construction work was done at Samyé during the day was dismantled at night. Shantarakshita urged the king to invite Guru Rinpoche, and he despatched envoys under the leadership of Nanam Dorje Dudjom. With his prescience, Guru Rinpoche knew already of their mission, and had gone to meet them at Mangyul, between Nepal and Tibet. According to Kyabjé Dudjom Rinpoche, it was in the Iron Tiger year (810) that Padmasambhava came to Tibet. 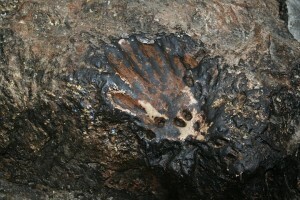 It is said that he was then over a thousand years old. On the way to central Tibet, he began to subjugate the local spirits and made them take oaths to protect the Dharma and its followers. He met the king at the Tamarisk Forest at Red Rock, and then went to the top of Mount Hépori and brought all the ‘gods and demons’ of Tibet under his command. Glorious Samyé—the Inconceivable—the unchanging, spontaneously accomplished temple’ was then built without any hindrance, completed within five years, and consecrated, amidst miraculous and auspicious signs, by Guru Rinpoche and Shantarakshita. scholars and masters, one hundred and eight in all, were invited; Guru Rinpoche, Shantarakshita and Vimalamitra gave teachings, and then worked with Tibetan translators, such as Vairotsana, Kawa Paltsek, Chokro Lüi Gyaltsen and Shyang Yeshé Dé, to translate the sutras, tantras and treatises into Tibetan; the first seven Tibetan monks were ordained into the Sarvastivadin lineage, and this was the time when the two sanghas, the monastic celibate sangha of monks and nuns and the community of lay tantric practitioners, came into being in Tibet; and Vairotsana and Namkhé Nyingpo were despatched to India to receive teachings, on Dzogchen from Shri Singha, and on Yangdak from Hungkara, respectively. At King Trisong Detsen’s request, Guru Rinpoche opened the mandala of the vajrayana teachings in the caves of Chimphu above Samyé to the twenty-five disciples, headed by the King Trisong Detsen, Yeshé Tsogyal and Vairotsana; nine of the twenty-five attained siddhis through practising the sadhanas he transmitted to them. It is said that he convened them in three great gatherings, to teach the Kagyé Deshek Düpa, the Lama Gongdü, and the Kadü Chökyi Gyatso. 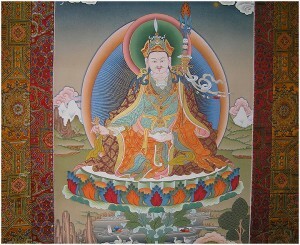 Guru Rinpoche made many prophecies about the future, and together with Yeshé Tsogyal concealed countless terma teachings, in order to: prevent the destruction of the teachings of the secret mantrayana; avoid corruption of the vajrayana or its alteration by intellectuals; preserve the blessing; and benefit future followers. For each of these terma treasures, he predicted the time for its revelation, the identity of the revealer, and those who would receive and hold the teachings. 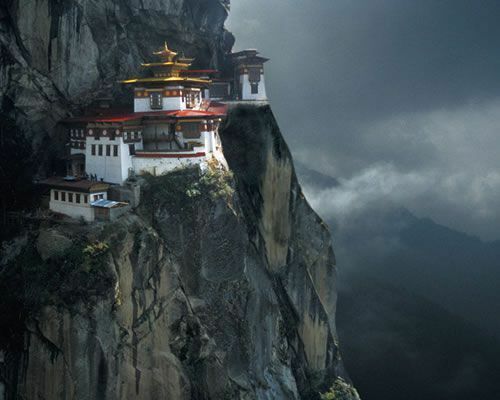 At thirteen different places called Tiger’s Lair, Taktsang, Guru Rinpoche manifested in “the terrifying wrathful form of crazy wisdom”, binding worldly spirits under oath to protect the terma treasures and serve the Dharma. Then he was named Dorje Drolö, ‘Wild Wrathful Vajra’. 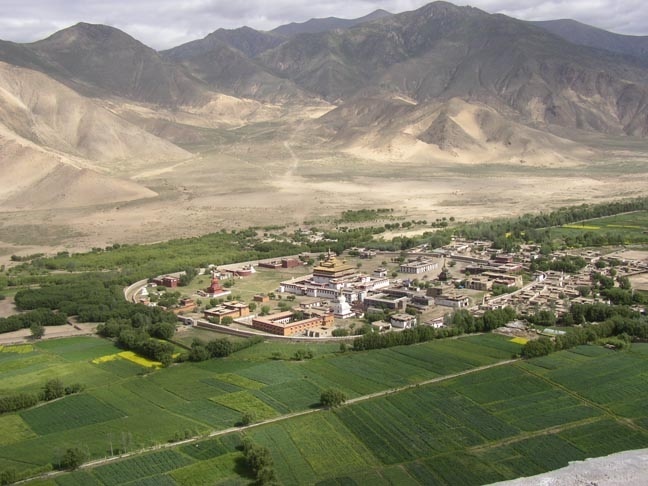 At Shyotö Tidrö in the Drikhung Valley, the great Guru transmitted the teachings of Dzogpachenpo, the Innermost, Unsurpassed Cycle of the Category of Pith Instructions, and the Khandro Nyingtik, to a single human disciple, Yeshé Tsogyal, and a hundred thousand wisdom dakinis. Later, at Chimphu, when Trisong Detsen’s daughter, the princess Pema Sel, died at the age of eight, Guru Rinpoche drew a red syllable NRI on her heart, summoned her consciousness, restored her to life and gave her the transmission of the Nyingtik teachings, soon after which she passed away. Yeshé Tsogyal concealed the teachings as terma, and centuries later, Pema Sel’s incarnation, the master Pema Ledreltsal, revealed the Khandro Nyingtik cycle. His next rebirth was as the omniscient Longchen Rabjam. After the death of Trisong Detsen, Guru Rinpoche stayed on in Tibet into the reign of his successors. But he knew that the rakshasa cannibal demons, inhabiting the south-western continent of Chamara—Ngayab—were set to invade and destroy India, Nepal and Tibet, and if not subdued, they would sweep the earth and destroy all human life. So, after fifty five and a half years in Tibet, in the Wood Monkey year (864), Guru Rinpoche prepared to leave, and went, accompanied by the young king Mutik Tsepo and a large gathering of disciples, to the pass of Gungthang in Mangyul. They implored him to stay, but he refused. He gave final teachings and instructions to each of them, and then, on the tenth day of the monkey month, left for the land of Ngayab Ling in the southwest, and for his manifested pure land on Zangdokpalri, the Copper Coloured Mountain of Glory.